Note: A Unified Threat Management serial is required to view this log data. For more information, contact your Smoothwall representative. The IDS logs contain details of suspicious network activity detected by the Smoothwall’s intrusion detection system (IDS).  Go to Reports > Logs > IDS. You can also choose to export IDS logs to a chosen format. 1. Go to Reports > Logs > IDS. • Month — From the drop-down list, choose the month’s data to export. • Day — From the drop-down list, choose the day’s data to export. The information is exported in comma separated text format. The file extension is .csv. The information is exported without formatting. The file extension is .txt. The information is exported separated by tabs. The file extension is .tsv. 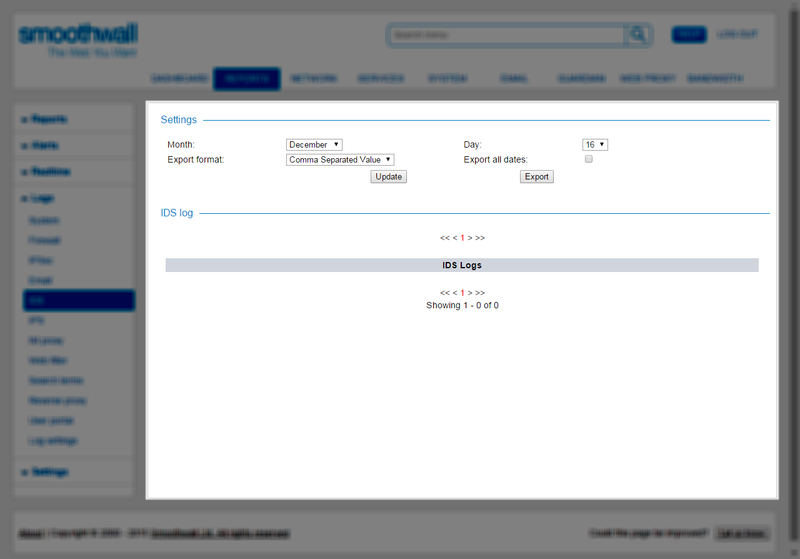 • Export all dates — Select this option to export all data for that section, for all available dates.